I do not guarantee that my transcription doesn’t include some pretty basic mistakes, apart from my poor typing ability and bad spelling, some pages were very marked making them hard to read. I hope this transcribed text will be well received, its easily searched with the find on page facility included with most any web browsers from the browsers edit menu. 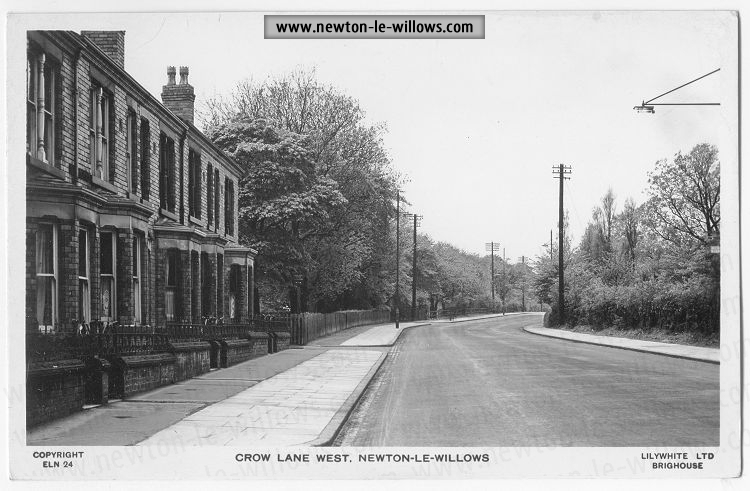 There are two sections to this article, Newton-le-Willows is the top one, and Earlestown is the lower one, Hope you find them useful. 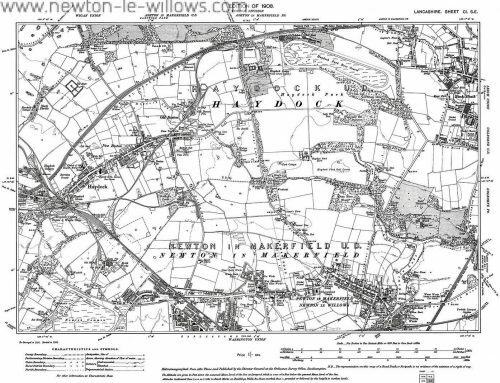 NEWTON-LE-WILLOWS (SEE ALSO EARLESTOWN), INCLUDING ASHTON-IN-MAKERFIELD (WITH DOWNALL GREEN SENELEY GREEN, NORTH ASHTON, EDGE GREEN, BROCKSTEDES, SIMS LANE END and PARK LANE), GOLBORNE, HAYDOCK, LOWTON AND WINWICK. 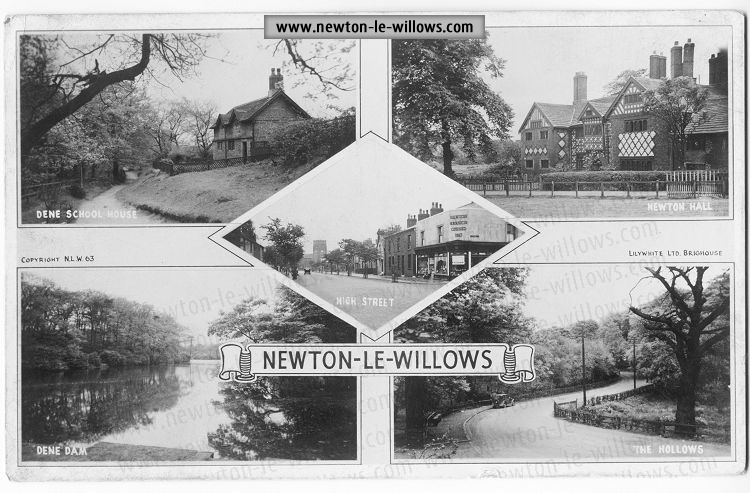 NEWTON-LE-WILLOWS (otherwise Newton-in-Makerfield) is a township and parish on the road between Warrington and Wigan and on the Liverpool and Manchester railway, with two rail stations, one at Newton Village named Newton Bridge, and another at the opposite side of the parish at the township of Earlestown, and is 188 miles from London, 14 miles south-west from Bolton, 15 3/4 miles east from Liverpool, 15 3/4 miles west from Manchester, 5 miles east from St. Helens, 5 1/2 miles north from Warrington and 7 miles south from Wigan, in the Newton division of the county, hundred of West Derby, petty sessional division of Warrington, union and county court district of Warrington, rural deanery of Winwick, archdeaconry of Warrington and diocese of Liverpool. The railway is carried over the valley of the Sankey by a magnificent viaduct of nine lofty arches, that which sans the canal being 63 feet above the surface of the water. The township was formerly governed by a board of Improvement Commissioners, but under the Local Government Act of 1894 has now an Urban District Council. The township being divided into five wards each having three representatives. 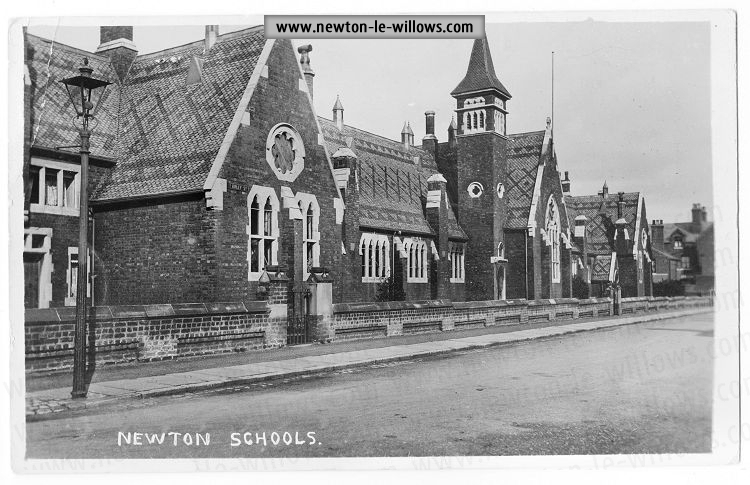 Newton returned two members to Parliament from the first year of Queen Elizabeth (1558) to the passing of the Reform Act in 1832, when it was disfranchised : it comprises the a ecclesiastical parishes of St. Peter, Emmanuel and St. John the Baptist, Earlestown. The parish church of Emmanuel, erected A.D 1841, is a stone building in the Early English style, consisting of chancel, nave, west porch and a small tower with spire over the western entrance containing one bell: there are 560 sittings. The register dates from the year 1842. The living is a rectory, gross yearly, value £300, average £242, with residence, with about an acre of glebe, in the gift of the Earl of Derby G.C.B., P.C. and held since 1892 by the Rev. .James Carson M.A. of Trinity College, Dublin, and surrogate. The population of this ecclesiastical parish was in 1891, 1,899 persons. 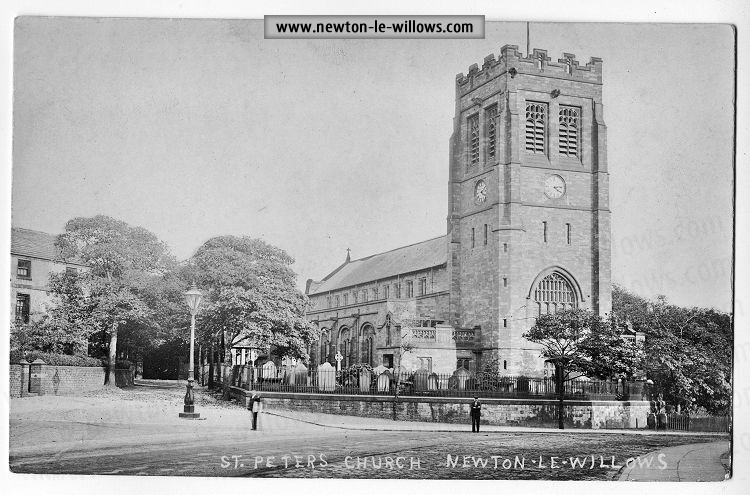 The church of St. Peter was originally built on land conveyed in 1683 but not consecrated till 1735; it was rebuilt in the year 1834, and reconsecrated in 1834: it is an edifice of stone in the Early English style, and consists of chancel, nave, choir, organ chamber, south choir aisle, vestry and heating Chamber : these additions to the nave were made in 1893, at a cost of £4,000 apart from costly gifts : there is a single bell on the apex of the western gable: there are 680 sittings. The register of baptisms dates from the year 1813, marriages from 1845. The living is a vicarage, gross yearly value £223, in the gift of Lord Newton D.L., J.P. and held since 1871 by the Rev, Herbert Monk M.A. of Trinity College, and Cambridge. The area of the ecclesiastical parish is 1,957 acres. The population in 1881 was 3,450, and in 1891 4,274. 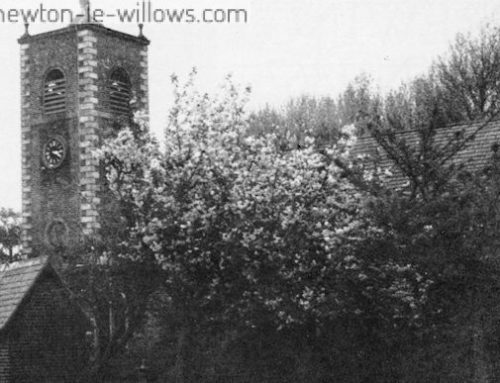 The Catholic church in Crow lane, dedicated to St. Mary and St. John, and erected in 1864 at a cost of about £7,000 from designs by Edward Blount, of London, is a stone building in tile Gothic style, consisting of apsidal chancel, nave, aisles and a tower with spire 120 feet in height: it will seat 600 people, and there is a cemetery attached to the church. The Congregational church, Crow lane, erected in 1878, at a cost of nearly £10,000, is a stone building in the Early Decorated style, with a tower and spire 143 feet high: an organ was added in 1884 at a cost of £800: the church will seat 800: in the burial ground attached is an obelisk of polished granite to Richard Evans esq. of Haydeck, d. Aug. 13th, 1864. 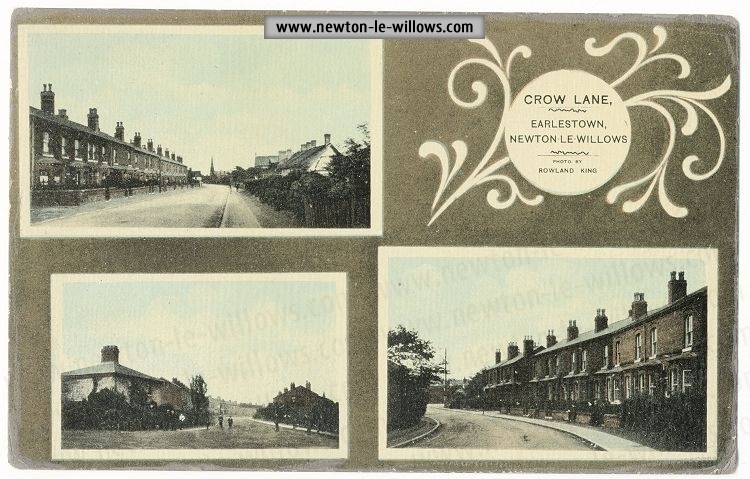 There is a Wesleyan chapel in Cross lane to seat 600. 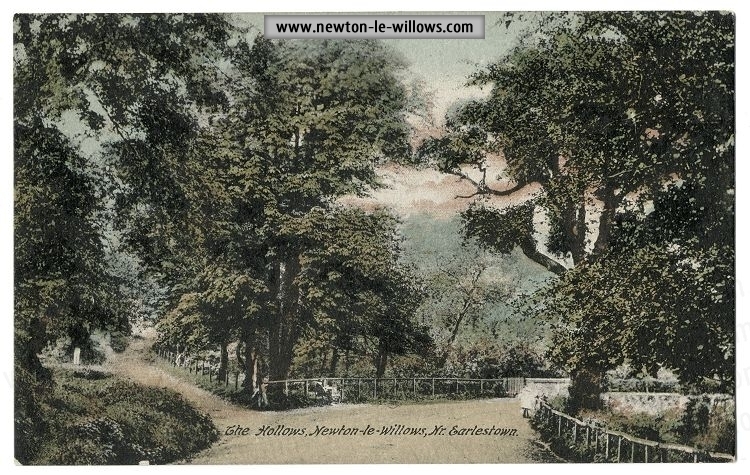 The cemetery of 8 1/2 acres was laid out at a cost of £5,000 by the Newton-in-Makerfield improvement commissioners, from plans and designs by Mr. Richard Brierley C.E. 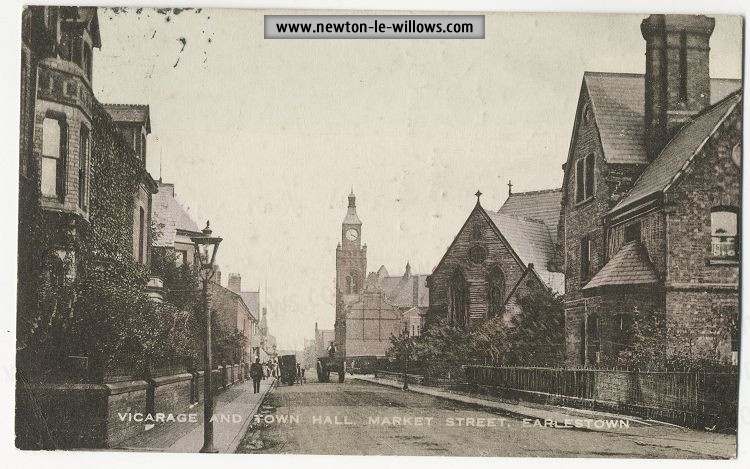 ; and a chapel, lodge and mortuary were erected in 1885. The poor have, £10 yearly on St. Thomas day in clothing. The Dean School Trust, value about £80 yearly, is awarded to four scholars upon examination, open to all the elementary schools of Newton Township. There is a foundry belonging to the Vulcan Foundry Company Limited, which gives employment to about 760 hands: the railway and general printing and stationery works of Messrs. McCorquodale and Co. Ltd, employing about 500 hands; and the paper mills of Messrs. Gillespie and Mason, employing about 200; two glass making establishments and other industries, and in the neighbourhood are the collieries of Richard Evans and Co. Limited. 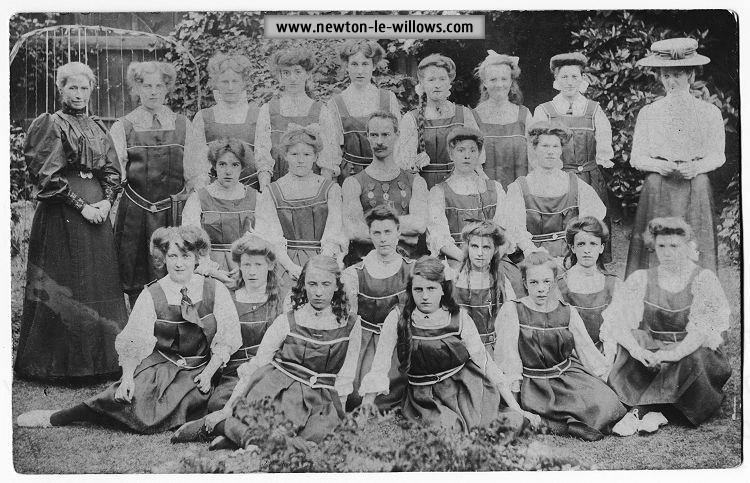 The Newton club, in Park road, was established in 1872 and has 35 members. 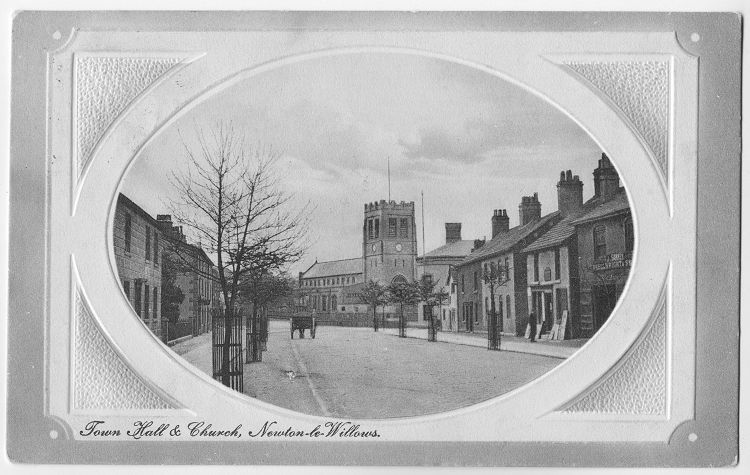 There is a Town Hall in the High street, at which a committee of the guardians of Warrington union, consisting of the elected guardians of the townships of Burtonwood, Haydock and Newton, meets alternate Thursdays at 4 p.m. to administer relief. A working mens club meets at the Town Hall, where there is a news room and there is also a cricket club. Fairs are held on the 17th May and 11th and 12th August, principally for horses, horned cattle, and sheep and pigs. There is a race course of 80 acres in extent, the property of Lord Newton D.L, J.P.; races are held annually about the last week in May or first week in June. 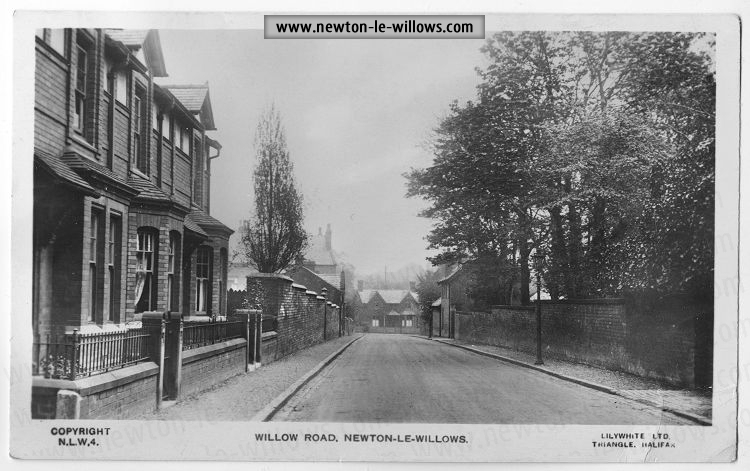 Lord Newton D.L., J.P. is lord of the manor of the barony of Newton and fee of Makerfield, and is also the principal landowner. Courts leet are held occasionally. The soil is various; subsoil, red sandstone. 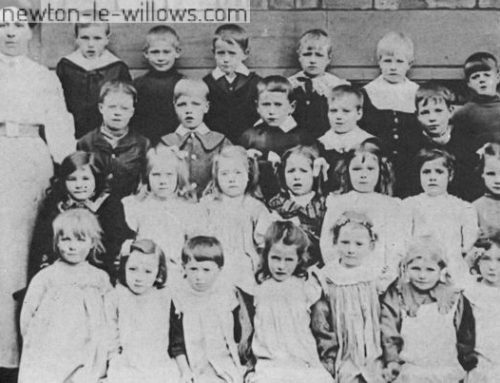 The area is 3,103 acres, of which 16 are water; rateable value £61,014; the population in 1871, 8,244, and in 1881, 10,580, including 149 in the Reformatory Farm School, and in 1891 was 12,861. The Liverpool Farm Reformatory School, the buildings of which are the property of the Liverpool Corporation, was certified April 12, 1859, and receives boys sent under the Reformatory Acts; it is one of the schools managed by the Liverpool Juvenile Reformatory Association, and the school is available for 150 boys; 33 acres of land are cultivated as a farm and market garden and there is a corn mill driven by water. Emmanuel, James Houghton, War grave. 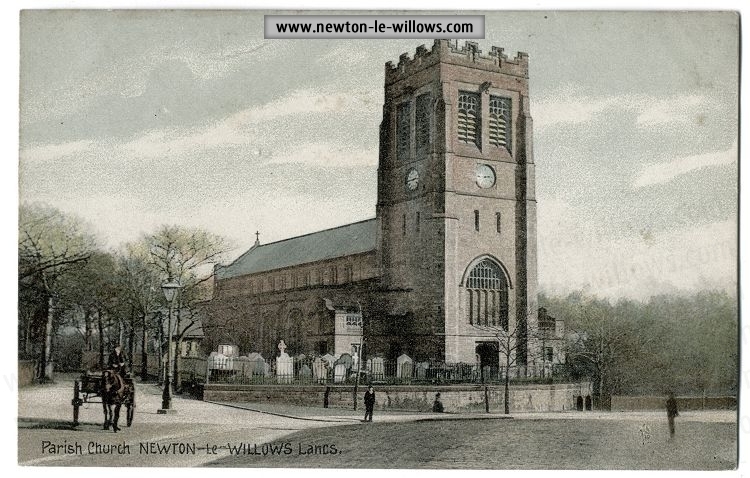 St. Peter, Robert Rigby, Mill lane, Newton-le-Willows. Head office, High street.-James Jordan, Postmaster. Ashton-in-Makerfield, Burtonwood, Collins Green, Earlestown, Golborne, Lowton, Lowton St. Marys, Stubshaw Cross, Wargrave & Winwick, 5 a.m.; All places south of Crewe, 9.10 am. ; Ireland & all parts West of Chester, London & London forward, Warrington, 9.66 am. ; Accrington, Ashton-under-Lyne, Blackburn, Blackpool, Burnley, Fleetwood, Liverpool, Manchester, Oldham, Ormekirk, Prescot, Preston, Rochdale, Southport, Stalybrige, Wigan, Yorkshire, North-West of England, North of Ireland (day mail) & Scotland, 11.10 am. ; Bolton, 1pm,; Warrington 1.25pm,; Belfast, Birkenhead, Birmingham, Burnley, Cambridge, Chester, Devonshire, Liverpool, North Wales, Preston , St Helens, Southport & South Wales, 2.15pm,; Ashton-in-Makerfield, Burtonwood, Collins Green, Wargrave, Winwick, 3 pm,; Manchester & Warrington 4.30 pm,; Wigan 5.30 pm,; All Parts- General Night Mail 8 pm,; Sunday Dispatch, All Parts- General night mail, 5.30 pm. Usually sitting here for the petty sessional division of Warrington, are same as at Warrington. Board day, lst Monday in each month. Clerk, Richard Brierley C.E. Town hall. Surveyor & Sanitary Inspector, Richard Brierley C.E. Town hall Market & Assistant inspector of Nuisances, John Gregory, Crow lane. Barton Thomas The Hollies, Wigan rd. McGeever James, Brookfleld, Wigan road, A .
Jones James G. (for W. Davis & Son, dyers, Liverpool), 31 Gerard- street, A.
Ritchie Robert, 149 High street, N.
Sutton James, Heath road, A.
Westbrook Elizabeth, 9 High street, N.
Pearson Thomas, Mercer street, N.
Whitley John & Co. (manufacturers of wrought iron hinges, thumb latches, Banbury & plate locks, Lancashire tools, files &c.), Ashton-T A “Wm 1 . LAND, HOUSE & ESTATE AGENTS. 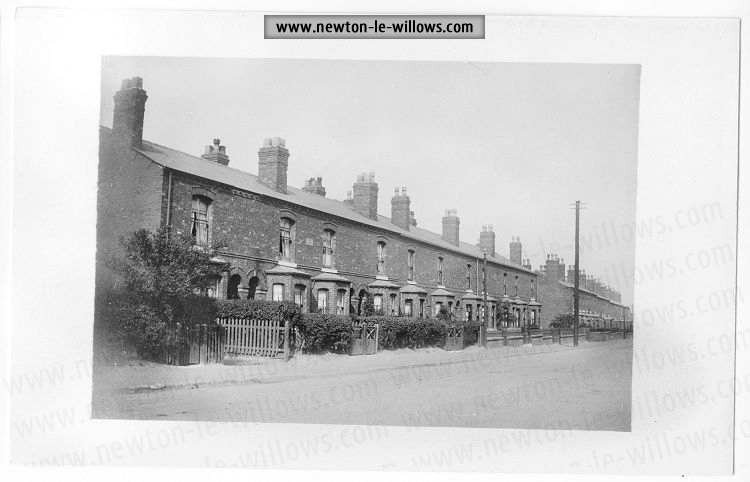 EARLESTOWN, WITH COLLINS GREEN, VULCAN AND WARGRAVE. EARLESTOWN is an ecclesiastical parish, formed May 17, 1879, from the civil parish of Newton-in-Makerfield, midway between Manchester and Liverpool, 4 miles east from St, Helens, 4 1/2 miles north from Warrington and one from Newton-in-Makerfield, with a junction station on the London and North Western railway, in the union and county court district of Warrington, rural deanery of Winwick, archdeaconry of Warrington and diocese of Liverpool. The church of St, John the Baptist was consecrated and the district assigned In 1879: the building, erected in 1878 at a cost of £8,000, is in the Early English style, consisting of chancel, nave, aisles, transepts and a western porch: it will seat 600 people. The register dates from the year 1879. 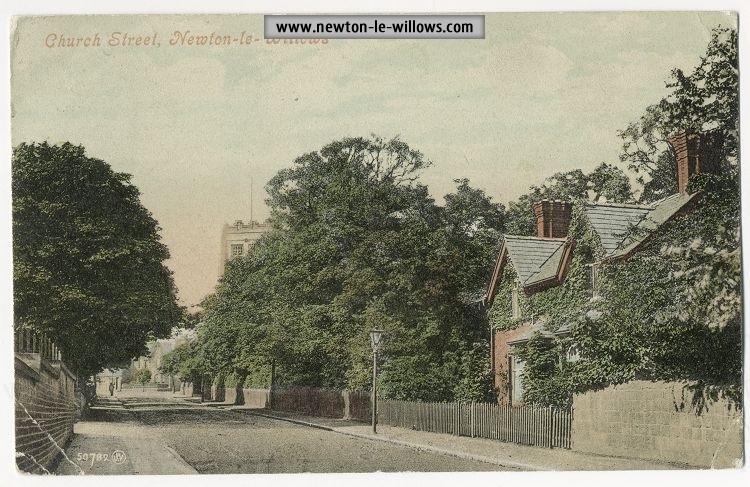 The living is a vicarage, gross yearly value £200, with residence, In the gift of the rector of Newton-in-Makerfield, and held since 1879 by the Rev. Thomas Roberts Matthews, of St. Bees. 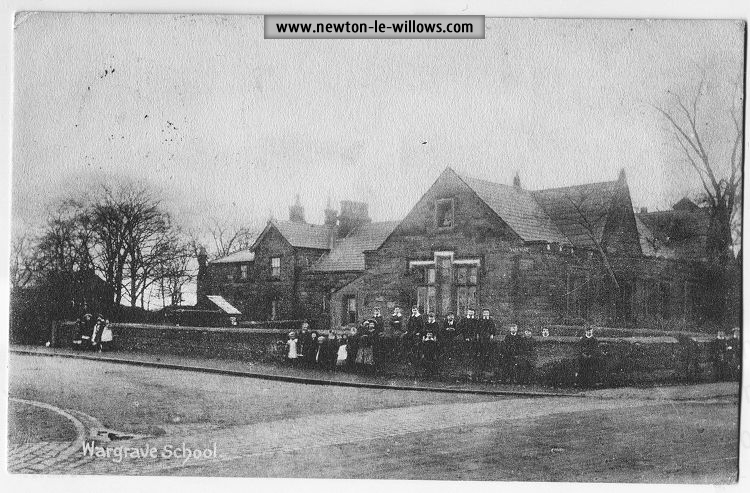 There are Primitive Methodist, Wesleyan and Welsh methodist chapels. A Mechanics Institute has been erected at considerable expense by the London and North Western Railway for the use of their workmen, comprising lecture hall and dinning rooms capable of accommodating from 600 to 800 persons. A market is held on Friday. The London and North Western Railway Company have a large establishment here for building their waggons, and employ about 1,200 hands, and the sugar refinery of the Sankey Sugar Company is situated near. 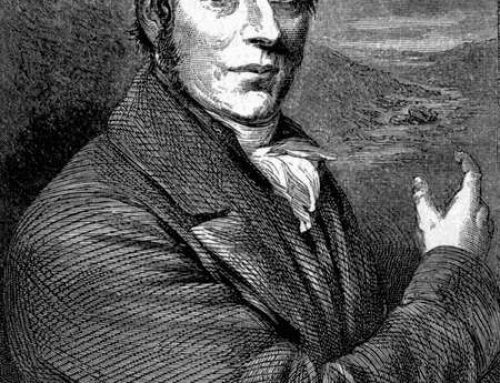 Lord Newton D.L., J.P. of Lyme Hall, Stockport, is the sole landowner. 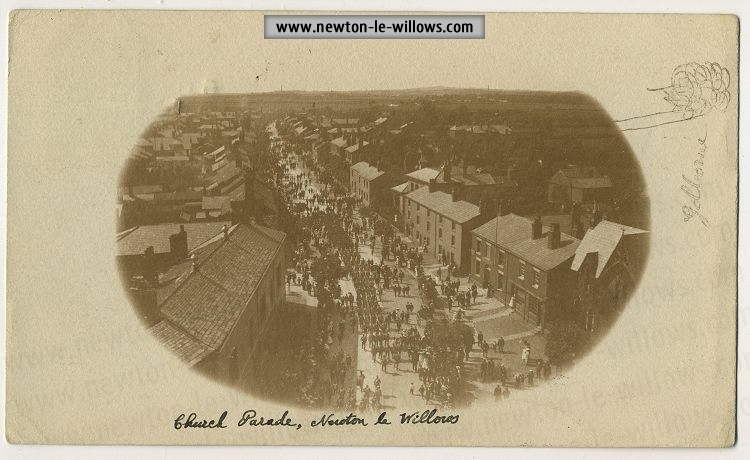 The population of the ecclesiastical parish in 1891 was 6,688. 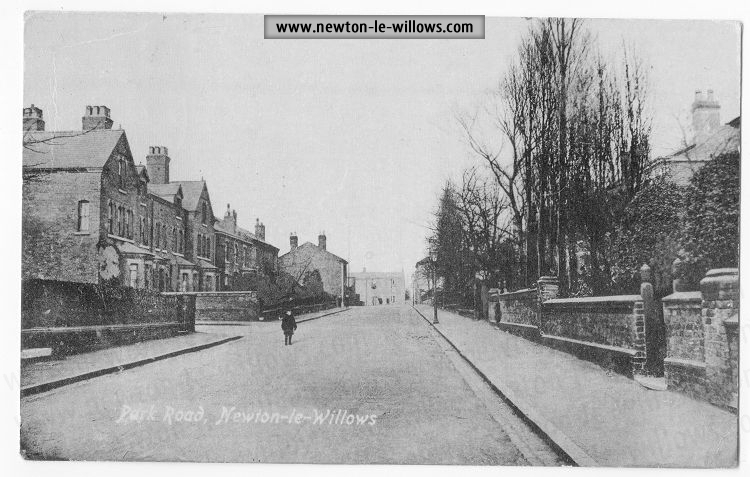 Earlestown & Newton Examiner, Market street, J. Walker & Co. proprietors; published Fri.
WARGRAVE is a village about a mile from Earlestown. 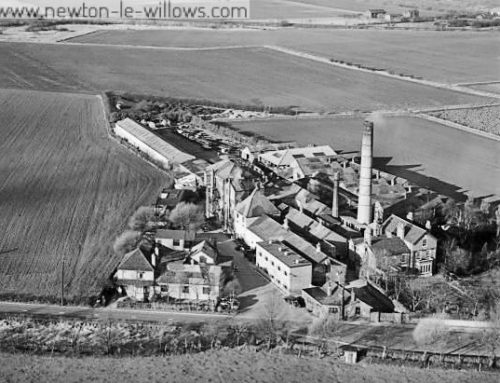 VULCAN is a village, close to Wargrave, and on the London and North Western Railway, between Earlestown and Warrington, consisting of a large number of cottages, Inhabited by the employees of the Vulcan Foundry Company Limited, from whIch the place derives its name. COLLINS GREEN Is a portion of Burton Wood 6 miles northwest from Warrington, and has a station on the Liverpool and Manchester section of the London and North Western railwayHere is a colliery, the property of the Collins Green Colliery Company Limited. Jones Rev. 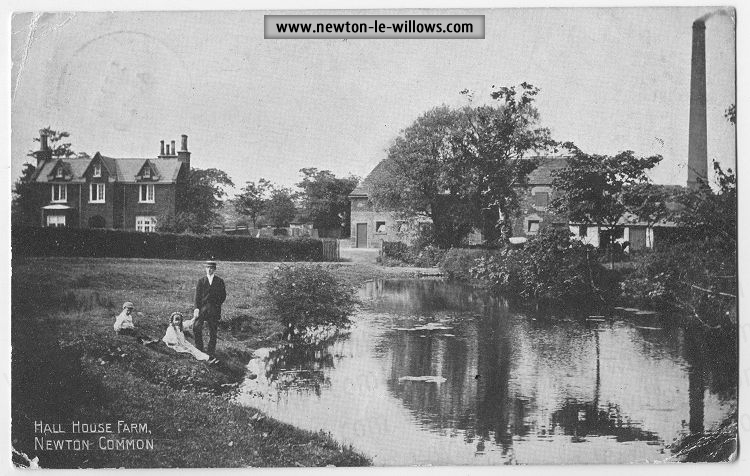 Thomas Wynne (Wesleyan),Willows lodge, Cross lane. Naylor Peter, 12 Earl street. Burke Margaret, 26 Queen street. County (fire)-Philip Chandley, 129 Earls st.
MUSIC & MUSICAL INSTRUMENT DEALERS.